Hineni, here am I, a survivor! The adventure continues! I wrote an article for this newsletter but so many other things wanted to be included, I am now saving it for next month's edition. It is the beginning of fall, my most favorite time of the year. The Jewish New Year occurs on Sep 16 and the Celtic New Year is Oct 31. So even though we might view autumn as a time of Nature progressing toward Death, it is also a time of harvest and of reaping. The beautiful colors can remind us that it is a time of celebration of transformation, recycling, and thus renewal. I have formally set my retirement date to be the last day in December. I am very excited about devoting my energy to shamanic energy medicine work and book writing full time beginning January 1. I figure that it is no accident that my transition is concurrent with the transition into the next 26,000 year Mayan cycle. And so the big adventure begins! For the past several months I have been studying death to learn about living. I have researched such subjects as Past Life Regression (PLR), Life Between Lives (LBL), and Near Death Experiences (NDE). Several weeks ago I had one of the most, if not the most, profound spiritual experience of my life. I underwent a Life Between Life regression. The process involves working with a Past Life Regression therapist who hypnotizes you into the theta state of mind. This level is deeper than the usual level that journeys and meditation creates. A normal LBL session lasts 3-4 hours and includes guided meditation to relax, regression back through your childhood, regression into your pre-birth womb, then passage into the most recent past life you have had. When you experience your “death” in that life you pass into the 5th dimension where souls reside when they are not incarnated. And there is a whole amazing world there! My LBL lasted 8.5 hours of which over 5 were in hypnotic trance. I came to my appointment with a list of specific questions I wanted answers to. I was able to get answers to all of my questions and much more. I met the librarian at the Hall of Records, my soul guide, my soul group, and the Council of Elders. I was able to find out so many things about myself, I consider this experience to be a destiny retrieval. I returned to this 3D world with clarity, purpose, and confidence in knowing my path and where I’m traveling to. The self-understanding I got from experiencing (and confirming my suspicions of) my recent past life provided a major healing for me and has already made significant impacts in my life. Integration of my experience is like solving a jigsaw puzzle. Little pieces of “aha!” moments keep falling into place, creating an even clearer picture of my life and my purpose. "Oh, that's why I do this. Oh, that's why I am like this. Oh! Oh! Oh!" I am sharing my experience in the hope that LBL/PL regressions become more common so that mainstream Western culture can eventually benefit from these spiritually therapeutic experiences. I believe they are so powerful that they can transmute some issues that may never change through more traditional type therapies. I highly recommend this experience to anyone that is ready for it. I promise you it will rock your world. I have illustrated what I saw during my LBL session. If you are interested in seeing these pictures, let me know and I am glad to share. In addition, I have a wonderful list of books on PLR, LBL, and NDE that I have read. If you would like a copy, please contact me. A mystery school has been called a university for the soul, a school for the study of spiritual concepts from various sources. The teachings of a mystery school are derived from ancient shamanic wisdom. Many of the subjects taught in a mystery school are considered esoteric because they have not been shared in Western mainstream schooling. And the mystery schools were named as such because members were sworn to secrecy about the rites and inner teachings of the schools. The term mystery derives from Latin mysterium, from Greek mysterion (plural, mysteria), meaning a secret rite or doctrine. An individual who followed a Mystery was a mystes, one who has been initiated, from myein to close, shut (closure of the eyes and mouth). The modern term mystic is a person who seeks a transcendental experience of the divine. A mystery school is not a religion but a place of study and practice. Mystery school is not about dogma or central authority figures. Each student is encouraged to be self-referencing, i.e. sourcing from their higher self and their personal spirit guides. One of mystery schools’ primary duties is to serve the Light and keep the ancient knowledge alive. Because of the massive shifts in energy occurring on Earth today and the critical need to raise the consciousness of the planets' inhabitants, mystery schools are releasing the ancient teachings for first time to the public. The only thing you can take with you out of this lifetime is the knowledge that your soul acquires. Anyone who sets an intention to learn and takes the action to attract knowledge becomes a receiver of the mysteries of the universe. 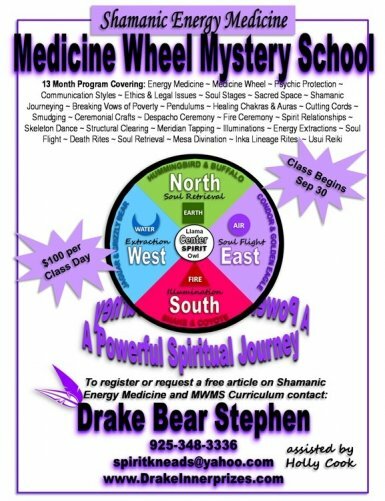 Mystery schools and medicine wheel programs are a journey of personal healing, powerful transformation, spiritual awakening. I have restructured the curriculum of my Medicine Wheel training to encompass more subjects which makes it more like a Mystery school. My new curriculum draws from many sources such as core shamanism, Peruvian shamanism, Native American and Celtic beliefs, Hawaiian Huna, Paganism, Wicca, Hoodoo Rootwork, Transpersonal Psychology, Energy Medicine, Light Work, and other modern metaphysical subjects. My program is really a smorgasbord of spiritual concepts where various flavors can be sampled. Each student can then pursue a deeper dive on the concepts that resonate with him/her. This program is ideal for any individual that is seeking a way to activate a daily spiritual practice. Spiritual awareness will be enhanced through learning enriching rituals and simple ceremonies that can be performed each day or for special occasions. This program is also a journey of personal transformation that clears past wounds to create the world you always desired. It helps you to develop the gifts that are unique to you so that you can activate them at their fullest power. What you see in the world is a mirror of how you see yourself. By increasing self-love & improving self-respect, your energetic vibration increases to a level that allows you to manifest your heart’s desires with ease. One of things that came out of my LBL regression was the validation that my last life was as a gay prisoner in the Nazi death camps during World War 2. 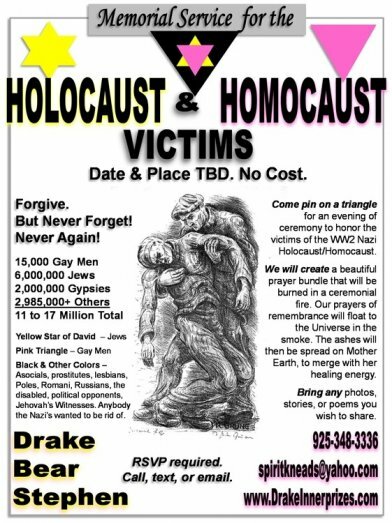 As a way to help heal that past wound, I am creating a Holocaust - Homocaust Memorial Ceremony. I believe that there are a lot of souls that have reincarnated into this time from the World War 2 period. I personally know a number of people who have memories of the Holocaust. My intention is that holding this memorial service will be a healing for both the victims then and the reincarnated victims now. The details of where and when the ceremony will be held are not yet set but if you are interested in attending, please email me and I will insure you are on the invite list. 27 January is International Holocaust Remembrance Day. It was designated by the United Nations General Assembly on November 1, 2005. January 27, 1945 is the day that the largest Nazi death camp, Auschwitz-Birkenau, was liberated by Soviet troops. Holocaust comes from the Greek word holókauston, meaning a whole (holos) burnt (kaustos) sacrificial offering to a god. 27 Nisan (on the moon-based Jewish calendar which is in April 8 in 2013 on the solar-based Western calendar) is Yom HaShoah (Holocaust Remembrance Day). It is Israel's national memorial day that was started in 1953. Shoah is the Hebrew word for “Calamity”. Originally Yom HaShoah was to be on the anniversary of the Warsaw ghetto uprising (April 19, 1943) but it was in conflict with Passover so it was set to be 8 days before Yom Ha'atzma'ut (Israeli Independence Day). 9 November is the anniversary of Kristallnacht (the Night of Shattered Glass) which occurred in 1938 and is regarded as the opening shot of the Holocaust. The Nazis began pogroms all over Germany. 267 synagogues were looted or burned, 7500 Jewish businesses were destroyed and 91 Jews lost their lives. Others were injured, cemeteries were vandalized, and over 25,000 Jews were arrested and re-located to concentration camps. However, the ceremony can be on any day as the Holocaust happened 365 days a year. The lighting of yahrzeit candles (candles of commemoration). Pinning on a triangle as a way of reclaiming, an act of returning the honor to the victims of the Holocaust/Homocaust. Sharing photos, stories, or poems. Creating a beautiful prayer bundle that will be burned in a ceremonial fire, where our prayers will ride the smoke to the Heavens. The ashes will eventually be put to rest on Mother Earth. Red—political prisoners: liberals, communists, trade unionists, royalists, social democrats and socialists, Freemasons, anarchists. Green—professional criminals (convicts, often Kapos, serving in exchange for reduced sentences or parole). Pink—sexual offenders, mostly homosexual men but rarely rapists, zoophiles and paedophiles. Brown—Roma (Gypsies) (previously wore the black triangle). Uninverted red—an enemy POW, spy or a deserter. Inmates were initially identified by numbers sewn on the clothes. However it was too difficult to identify corpses, once clothes were removed. So when Soviet POWs started coming in 1941, they were tattooed with a special stamp on the upper left breast. Beginning in 1942, numbers were tattooed with a single needle on the left forearm. The Auschwitz Concentration Camp Complex was the only location in which prisoners were systematically tattooed. 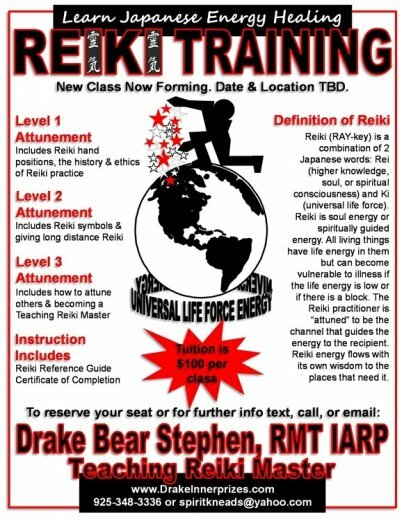 I am now taking names of people who are interested in taking Reiki Levels 1, 2, and/or 3. Please contact me if you would like to become attuned to this amazing energy.